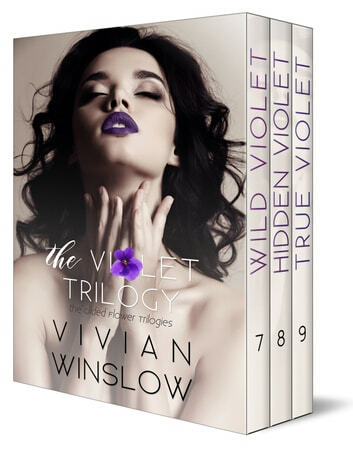 Appearing in The Lily and Dahlia Trilogies of Vivian Winslow’s incredibly steamy Gilded Flower Trilogies, Violet Rai, or Vi, is Lily and Dahlia Baron’s sharp-witted BFF, who is always up for a party and a hot guy. But, in The Dahlia Trilogy, there are hints that Vi’s world is quickly coming apart. * Each trilogy of The Gilded Flower Trilogies may be read independently, though the background from the earlier trilogies may be helpful to the reader. The Lily Trilogy is the first in the series, followed by The Dahlia Trilogy and then The Violet Trilogy. The entire Gilded Flower Trilogies is now available.